Signed up for NEOS…so what happens now? It might seem like there’s a long break between sign-up and the North East Open Studios event, so we thought you might like to know what will be happening behind the scenes on your behalf. For the first week or so we are busy bees checking with people whose entries are incomplete and also to those who we’ve no record of payment. Thank you to everyone who used their unique reference code this year, it really helped our Treasurer. Once signup closes on 31st March we find out the total NEOS members for the year. 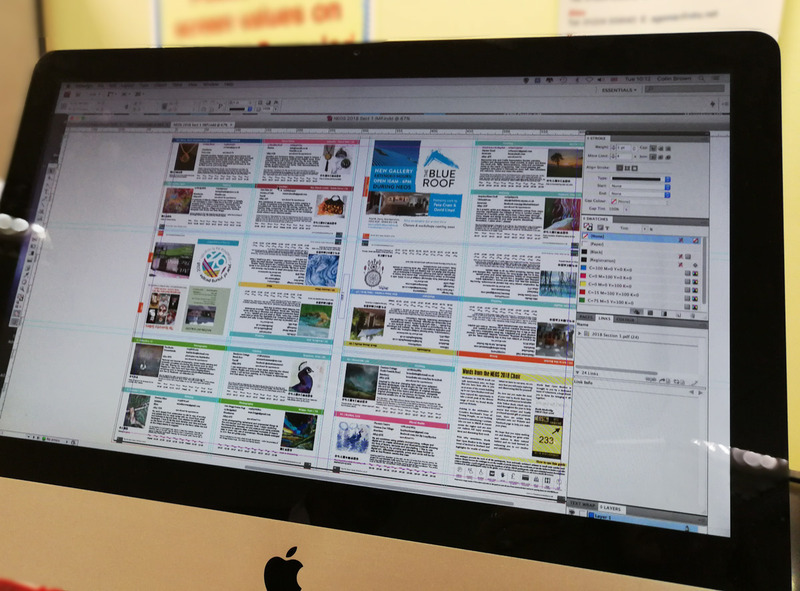 Every year it varies, and we liaise with the printer to calculate the size of each year’s directory so that we can order the paper stock for the project. 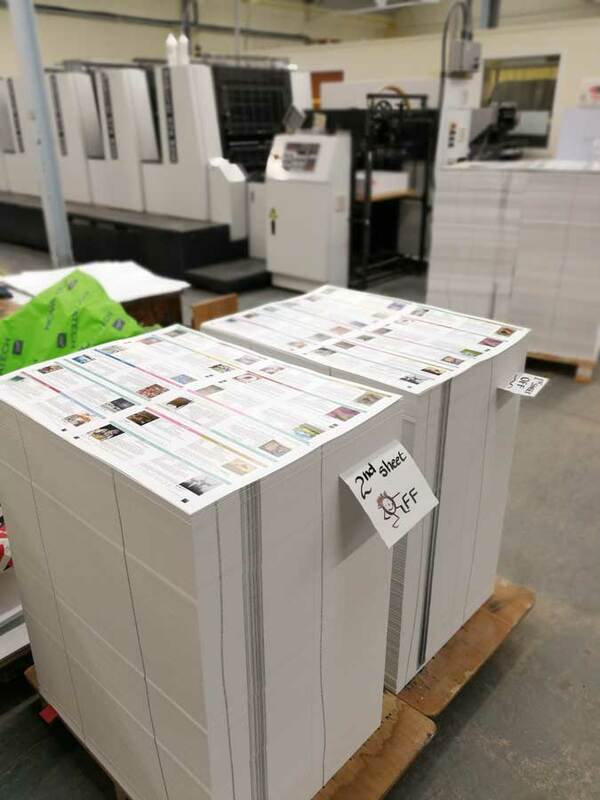 It takes two months to arrive for the print run and last year we used 10 tons — it was delivered on 13 pallets. 10 tons of paper for NEOS yellow book in 2108. If it was laid edge-to-edge, that would be 140 miles of paper! At the same time, a small team of NEOS volunteers use your venue address, the discipline you registered under and your coordinates to plot your studio/space on the location map as a coloured dot. This is printed along with the NEOS book. And our coordinator, who downloads, checks and debugs the database, will use the information to organise a group of centralised pick-up-points where you will eventually collect your allocation of NEOS books in August. The committee check the digital book for obvious mistakes and then pass it on to you to proofread your entry. This is the only time we can make amendments, so you need to take this stage seriously. Everyone checking at the same time allows us to go to print with no mistakes. Don’t skip this stage! We let you know by email when you can view the digital proof. After that it goes to our designer to prepare the artwork. By the end of this month the book artwork is at the pre-press proofing stage, and a small team go to the printer to sign the artwork off so the plates can be made for the litho printing. Our Social Media campaign will begin with members images being shared on Facebook, Instagram and Twitter. It would be great if you would comment and share too. The wider we spread those ripples, the more people we connect with! If everything goes smoothly the artwork files for the NEOS book and the map are at the printer now. Printing 27,000 copies takes 6 weeks. 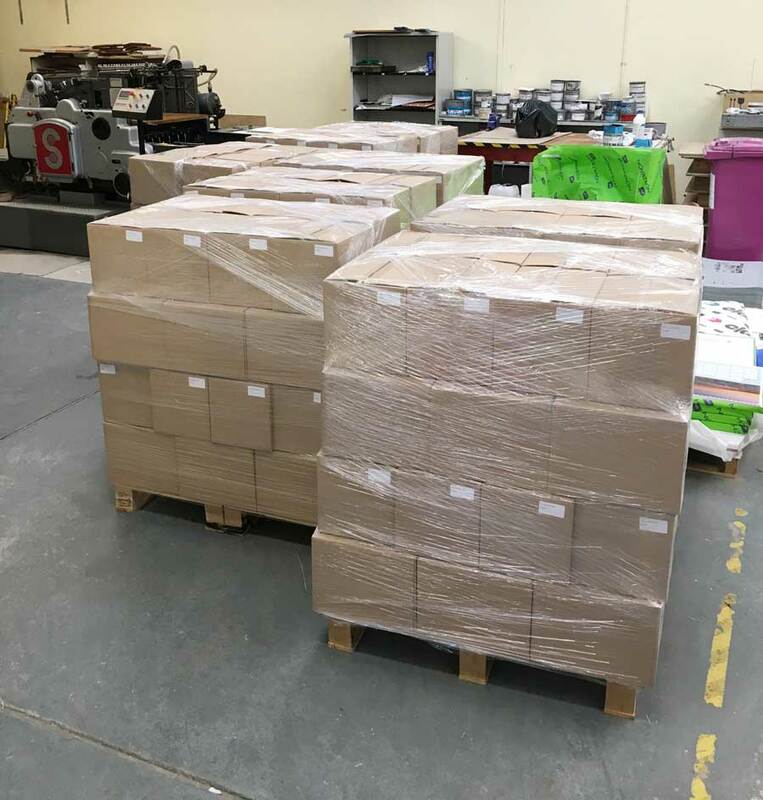 After which the printed pages are loaded onto pallets and travel to Edinburgh to the book binders. Ready for the book binders. Our NEOS directory is burst-bound; a process that enables it to be opened and flattened at any page without breaking the spine. Our online Social Media Marketing continues with #NEOS2019. We use Instagram, Facebook & Twitter and we hope you’ll join in. We will do our best to share your posts if you use our handle @neopenstudios on Instagram, @NorthEastOpenStudios on Facebook and @NEOS_uk on Twitter. 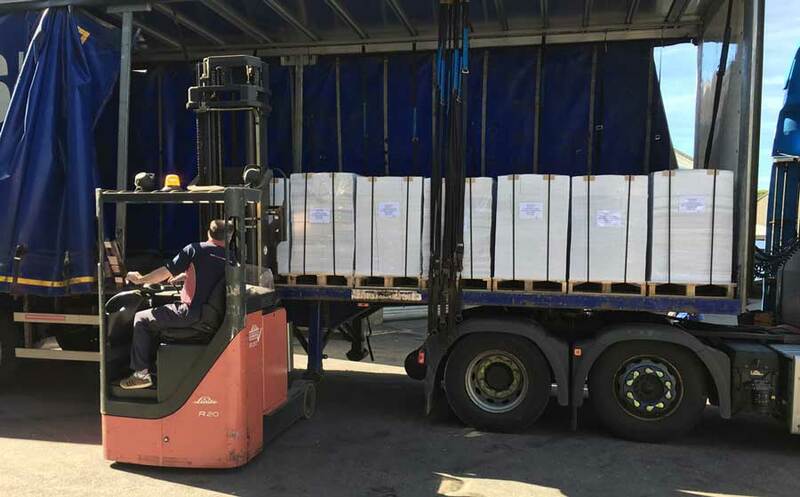 The printer delivers around 15 pallets of NEOS yellow books to the pick-up-points and we will let you know where your pick-up-point is to collect your quota. This year everyone will also collect new yellow signs and window stickers, as we realise it’s a while since regular members have had new ones. These come as part of your membership for the year. You are very welcome to add to these items with your own marketing materials. You’ll get NEOS logos here. NEOS Yellow books ready to dispatch. One of these boxes is given to every member for distribution. There were 15 pallets in 2018! Well obviously, this is when the fun really begins!